So this is the inaugural, first post in my new Single Malt Whisky category! Trust me when I say there’s going to be many more posts here! I love Single Malt Whisky, seriously, I’m not such a big fan of blended Whisky – but I don’t mind the American stuff like Sourmash and Bourbon. I don’t know a whole lot about them though, so I’ll mostly be sticking to what I know and love – which is scotch. Not too long ago I got invited to a Glen Grant Whisky tasting in KL, they are starting to sell it in Malaysia now under Albert Wines. Glen Grant is a Speyside distillery, that produces single malt Scotch whisky. The distillery was owned by Chivas Brothers Ltd, best known for their Chivas Regal blended scotch whisky. It is the world’s second-biggest single malt whisky brand. 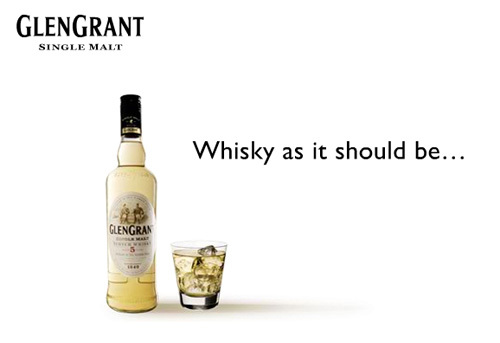 Single malt that’s clear in colour with a distinctively crisp, fresh taste that has made it one of the world’s favorite. 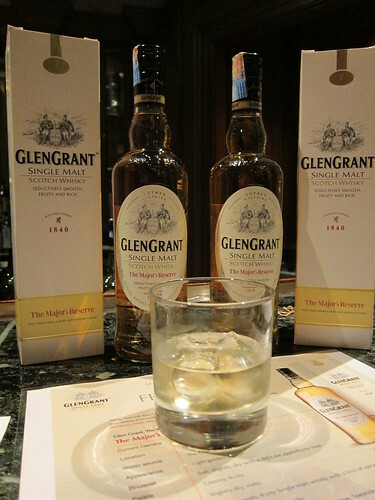 We got to test out the whole range, starting with the Major’s Reserve – this is a no-age-statement entry-level Glen Grant. Although from what I understood, it’s about 6 years old – but they don’t advertise that. This is a very accessible, approachable malt ideal for beginners. I found it rather pleasant actually, especially for the age, the price range and the fact it was the very bottom tier – it was better than the 10yr offerings from many other commercial brands. Of course it can’t match up to the higher grade whiskies, especially in terms of body – but it’s a decent starter drink. Some may prefer to stick to something familiar though in this price range like a Teacher’s or Jameson’s. Next up was my second favourite of the night and the most popular seller in the Glent Grant range – the classic 10 year old. I have to say – I really want to get myself a bottle of this! A very enjoyable, smooth single malt, which breaks well with a little bit of ice. It’s quite intense and fruity (features that I enjoy) and has a long and slightly nutty finish. After that 10 year old, we followed on with the 16 year old. I found this one a little bit harsher and actually preferred the 10 year old to this. It has the same type of characteristics of the 10 year old, but intensified. 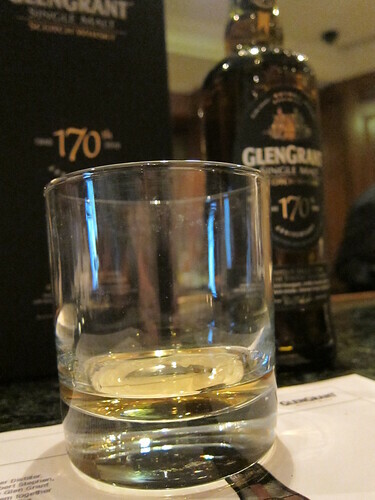 For me, the next was the best of the night – and to date one of the drams that really sticks in my memory. 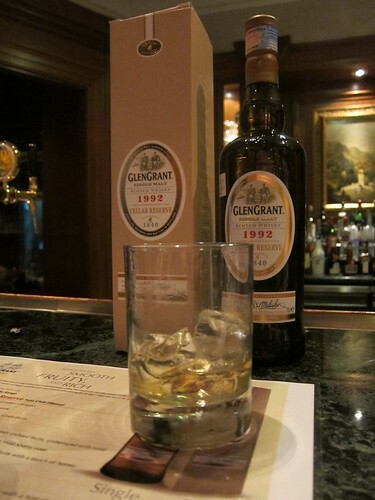 It’s the Glen Grant 1992 Cellar Reserve – wow, what a drink. Even the Whisky Bible 2010 agrees and awarded it Best Single Malt (16-21 Years). Sadly there was only one bottle of that, Vijen and I surely did enjoy it. It’s aged in Olorosso sherry casks which give it a beautiful deep flavour, it’s fruity and sweet with a sherry overtone basically. Wonderful! 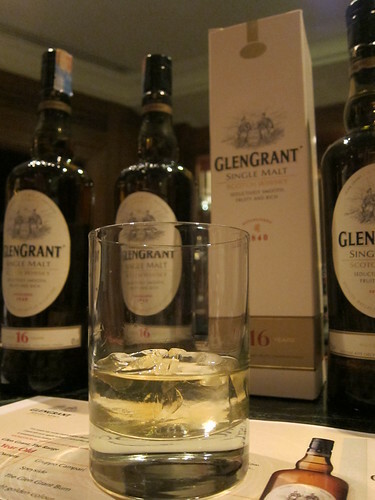 The last of the night was the Glen Grant 170th Anniversary – which was a higher strength drink at 46% – but I can’t say I really enjoyed it. It was super light in the mouth, almost feeling like it evaporated as it hit your tongue. Taste wise, it is similar to the others with a hint of smokey peat. Something for the collector perhaps. 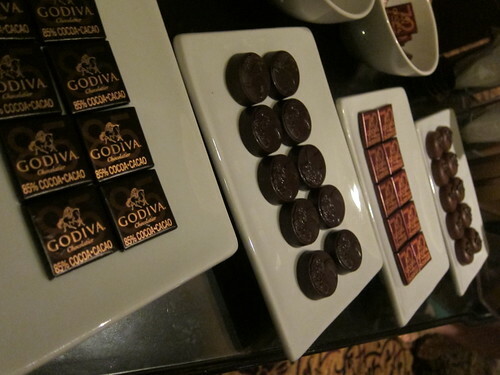 The whisky was paired with some wonderful cuban cigars and chocolate from Godiva. 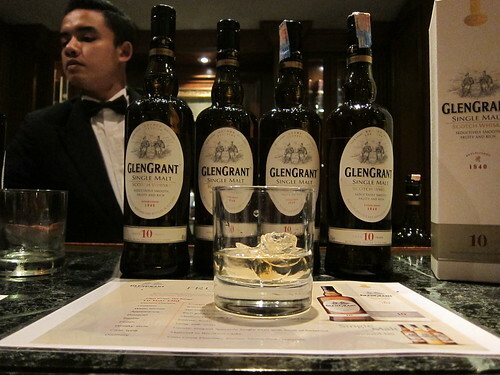 As for getting hold of some Glen Grant – the only place I know of selling it right now is Bakita at Changkat. If I remember correctly the 10 year old is RM390 per bottle and the 16 year old is RM400 per bottle. It was a great evening (Thanks Winnie!). The George and Dragon stocks it as well. Oooh yeah, the 1992 is AWESOME. Enjoyed reading your post, even though I am not a whisky fan. Having said that, when I worked in Ghana, a cultured Ozzie introduced me to Knockando single malt and man, that was a bloody good drink. man that was one stoning night. 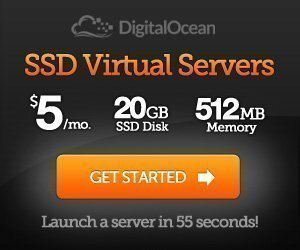 Dinesh Nair: Ah cool, didn’t know about that. eyeris: Yah mon, that’s the the one I want! kaminski: Haha yah, Single Malt is the way forwards! myhorng: Yah I wouldn’t mind a bottle of 10 year old either – pretty good stuff. The 1992 tho – wow, really good. Can’t believe my eyes – the higher quality Glens were drunk out of Tumblers with ice!!! Who the hell offers fine whiskies that way!!!! !